The latest developments in science policy, hands-on examples from scientific communities as well as current developments in FAIR Data in the field of research data management. This is what was on offer at the Open Science Conference from 13 to 14 March 2018 in Berlin. Open Science is being put into practice. However, this should not be taken for granted; there are still a few challenges to overcome. At the curtain-raiser of this year’s Open Science Conference, Dr Georg Schütte, State Secretary of the Federal Ministry for Education and Research (BMBF), emphasised that the Open Science community will have to be strategic, fast and relevant enough to drive the issue forward. As part of his opening speech on the second day, Professor Dr-Ing. Matthias Kleiner, President of the Leibniz Association, pointed out firstly that Open Science could serve to restore the trust of the civil society in science and secondly, that it represents an opportunity to improve the quality of research. This was the background for the fifth Conference of the Leibniz Research Alliance Science 2.0, which featured a mix of talks, a panel discussion as well as a poster session, and took place in Berlin for the second time from 13 to 14 March 2018. Out of the 200 participants from 35 countries, many participants were from the world of science, such as researchers, science policy decision-makers and representatives from research infrastructures. 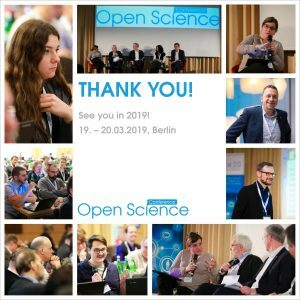 As in the previous year, the Open Science Conference was already sold out within the first few weeks and has thus become one of the main events on the subject in Europe. Alongside a growing number of researchers who are getting familiar with Open Science practices and tools, an increasing number of overriding structures are being put in place to promote Open Science. Many projects and initiatives, backed by corresponding support programmes, have been launched in the last few years in order to promote more open practice in science on a daily basis. It will be a great challenge to initiate a wide-reaching cultural transformation in a scientific system based on reputation. Certain research communities have already set their own Open Science standards to help them overcome their subject-specific replication problem, example. Dr Felix Schönbrodt (LMU Munich) provided a small insight into the psychology as part of his lecture. He emphasised that Open Science is the obvious way to carry out research in the spirit of good scientific practice. The basic requirements are infrastructure and (easy to use) tools which are geared towards the scientific workflow. Working on this basis, communities would be able to define Open Science standards and promote them using incentive structures and/or demand them through corresponding policies. One psychological journal demonstrated that an Open Data badge could significantly increase the proportion of research data supplied to a publication. For a number of years, there has also been a passage in the appeal process for the Faculty for Psychology and Educational Science at LMU Munich, which requires applicants to comment on open-ended practices. Dr Emily Sena (University of Edinburgh) gave an insight into the medical community in her presentation, with a particular focus on pre-clinic research. She pointed out the strong bias in scientific results, due in particular to a focus on positive effects and the non-publication of neutral or negative effects. This means that many results and preliminary studies are never taken into account, which may lead to a demonstrable misjudgement in assessing whether new types of treatment are effective, for example. What’s more, many studies are not reproducible, often due to a lack of research data. The problem is well-known, and Open Science practices could be the solution. Sena showed a number of tools with which it is already possible to address these problems by publishing data or preregistering methodologies before the corresponding study is carried out. An increasing number of researchers are prepared to start practicing Open Science, but there is often still a lack of knowledge and structural support. Many of the talks addressed the fact that Open Science is often not fully understood and requires greater explanation. Professor Wolfram Horstmann (SUB Göttingen) pointed out in his presentation that it takes 90 minutes to explain the complexities of Open Science. So how is it it is possible to convince researchers about Open Science? Do we need an elevator pitch for Open Science? Horstmann drew a connection with Open Access by asking what lessons it can teach us with regards to Open Science. It took 25 years before Open Access became popular on a wide scale. Does that mean it will take Open Science until 2035? And if Open Access solves the problem of accessing scientific literature, what problem does Open Science solve? Open Science starts out locally on the level of researchers, among whom it needs to be implemented early. The cultural transformation is always brought up as the biggest hurdle. That is why it is important to anchor Open Science in scientific education as early as possible. There is also a lack of orientation for researchers. Since there are now a number of projects, tools and initiatives, it is hard to get an overview. With this in mind, a useful initiative in is the EU project OpenAIRE, which Natalia Manola (University of Athens & Athena) introduced in her talk. OpenAIRE is a large-scale European initiative for promoting Open Science. As well as infrastructure and services, there are also 34 national helpdesks, which are not only intended to be used by researchers. For example, the so-called ‘Train-the-Trainer’ programme (in the context of research data management, for instance) might be used to train Open Science disseminators on multiple levels. However, all of these efforts are not only concerned with finding a universal solution, but rather a solution that is adapted to requirements in the spirit of ‘Open Science as a Service’. One key theme addressed at the conference was research data. A majority of the research data generated nowadays is still not subject to professional research data management, or might not be stored in repositories, and so cannot be used by other researchers. Since open access is not always possible (for example in the case of personal data), the FAIR principles (findable, accessible, interoperable, re-usable) were established as a conceptual framework for ‘fair’ access to research data. That is why the FAIR principles and how to implement them on a practical level comprised the subject of numerous presentations and the panel discussion, in which it was explained that Open Data and FAIR Data are two complementary concepts. Sarah Jones (DCC) highlighted in her talk that professional research data management is a must when it comes to FAIR Data and Open Data, and was thus banking on the findings of the panel discussion. This means that both concepts have to be separated from one another. Applied strictly, Open Data aims for the publication of as much research data as possible. FAIR principles, on the other hand, take into consideration the fact that it is not possible to make all data accessible (such as data from the private sphere, industry-oriented research). Nonetheless, a combination of Open Data and FAIR would make sense. One means of promoting and/or supporting research data management, is to make it obligatory, as in the case of EU proposals, for example. Dr Jean-Claude Burgelman (European Commission) explained the current status of the European Open Science Cloud (EOSC) in his presentation. Here, all data should be accessible by default in line with FAIR principles, whereby an ‘opt out’ is possible at any time if there is appropriate justification. In order to drive forward the implementation of FAIR principles, a ‘FAIR Data expert group’ has been established on the EU level, which will publish relevant recommendations within the context of the EOSC later this year. Dr Juan Bicarregui (Science & Technology Facilities Council) explained how far the implementation of the EOSC has come in his talk on the EOSCpilot. The GO-FAIR initiative is already in place on the level of EU member states, which Professor Karel Luyben (National Coordinator for Open Science Netherlands) introduced in his presentation. One measure that was implemented within the framework of this initiative was that relevant ‘Support Offices’ were set up in the Netherlands and Germany. These will provide support in the establishment of the EOSC, but also in setting up a global network and promoting collaborations in the context of FAIR Data. The aim is to develop a worldwide ‘Internet of FAIR Data and Services’. The talks at the conference showed that there are still many hurdles to overcome in the realisation and/or concrete implementation of FAIR principles. Dr Simon Hodson (CODATA, EC FAIR Data expert group) pointed out in his presentation that the ‘Interoperable’ (I) and ‘Re-usable’ (R) are the most significant construction sites. Machines will have to be able to capture and process data and information in an automated manner. This is where cooperation with the communities who take care of archiving research data will be useful. Other talks pointed out how professional data management works at present. As part of his lecture, Dr Robert Jones (CERN) used the example of CERN to show how experiments in the particle accelerator generate and process huge volumes of data. Stefan Bender (German Central Bank) demonstrated in his talk how data management of microdata works in the Central Bank of Germany, where access to this often sensitive data is subject to strict guidelines. Professor Klaus Tochtermann (ZBW, Chair of the Conference) noted that the Open Science Conference had provided a good insight into how Open Science is becoming a part of daily scientific operations. It has become clear that it can be used to significantly improve the quality of scientific findings. Progress is already visible in many communities. What’s more, the Open Science Conference 2017 already proved that FAIR principles have achieved some acceptance in the debate about science policy. This year showed that great efforts are now being made to substantiate and thus operationalise the FAIR principles. A significant next step would be the acceptance of Open Science and a further increase in the use of FAIR Data within scientific communities in concrete terms, as well as more support in the development of tangible practices. This does not automatically mean researchers have to become infused in all of these aspects themselves. It is much more important for the necessary framework conditions (e.g. in the form of Data Scientists) to be put in place. Here, it is important to learn from the experience of existing communities.